FAU President Prof. Dr. Joachim Hornegger invited members and friends of the University to celebrate its 273rd anniversary in the Audimax on 4 November. During the celebrations FAU awarded the Renate Wittern Sterzel Prize and the Habilitation Prizes, and announced the appointment of a new FAU ambassador. The main topics of the President’s report were the developments that have taken place over the past year and the challenges that FAU will face in the coming year. In his opening speech, the President informed FAU’s academic community, its friends and supporters and the general public about the successful achievements of the past twelve months. ‘With around 650 professors and 40,000 students, a number which remains at an all-time high, FAU is not only one of the ten largest universities in Germany but is also a university that stands out due to the excellent quality of its teaching and research,’ Professor Hornegger said. FAU has been awarded system accreditation for its teaching and also had its funding application accepted in the second round of the German government’s teaching quality initiative; the University will use the 10 million euros that it was awarded in this context to continue to improve the options it offers students. 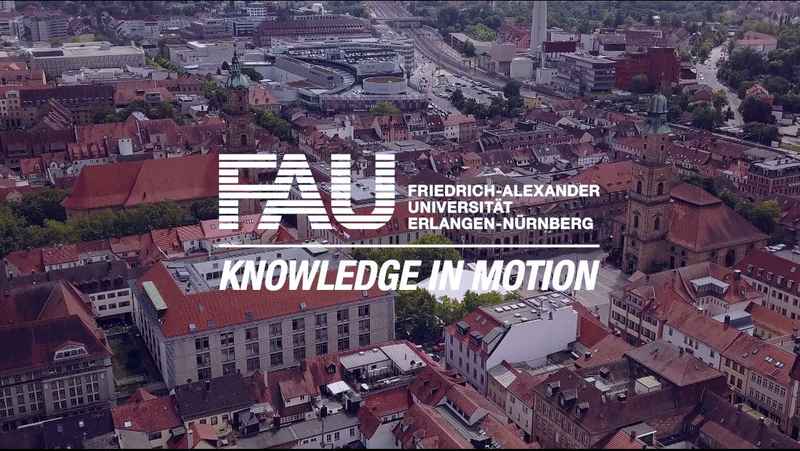 Professor Hornegger emphasised the key role that students play in shaping many areas of life at FAU, such as through their involvement in projects for refugees, in debates about freedom and responsibility in research, and in artistic and cultural projects. FAU’s power of innovation is one of its key features: ‘Today we are one of the top 50 most innovative universities in the world,’ the FAU President explained. In fact, compared with last year the University has gone up three places in the latest ranking by Thomson Reuters. A key indicator used to measure innovation – in addition to collaborations with industry and the numbers of patent registrations and publications – is third-party funding. FAU brought in 180 million euros of third-party funding in the academic year 2015/2016, demonstrating that many of its researchers’ ideas are better and more pioneering than those of their competitors. Prof. Dr. Claus Schnabel discussed phenomena in the labour market in the ceremonial lecture. Professor Schnabel has been Chair of Labor and Regional Economics at FAU since 2000. His research focuses on topics including employer–employee relationships, wages, tariff policies, unions and works councils, and founding and closing companies. Musical entertainment was provided by Funk Factory. The quartet is made up of members from FAU’s Big Band. This year the title of Honorary Senator, the University’s highest honour, was awarded to Dr. Adalbert Weiß and Prof. Dr. Hans-Joachim Freund. With this award, FAU would like to show its gratitude for their long-term commitment and support. Dr. Adalbert Weiß held various positions in the Bavarian State Ministry of Education, Science and the Arts from 1977 until his retirement in 2015 – and played a key role in the development of FAU. For example, the University received particular support from Dr. Weiß for the construction of the new building for mathematics and computer science, the renovation of the Orangery (a listed building), the establishment of the Max Planck Institute for the Science of Light, and the decision to base the Helmholtz Institute close to FAU. Dr. Weiß was closely linked to the University through his role as deputy chairman of the board at Universitätsklinikum Erlangen, a position he held for eleven years. Prof. Dr. Hans-Joachim Freund, an award-winning researcher, was professor of physical chemistry at FAU for four years from 1983. After moving elsewhere he maintained close ties to the University. Professor Freund was a member of the University Council from 2002 to 2015, and its chairman from 2006. In this position he contributed to the design of FAU’s mission statement and degree programmes, as well as the University’s successful applications in the first two rounds of the Excellence Initiative. Since leaving the University Council, he has continued to support FAU in the field of science management. A new FAU Ambassador was appointed this year: Prof. Dr.-Ing. Vijay Bhargava. Ambassadors represent FAU’s interests in their home country and pass on the experience gathered at FAU in their own spheres of research. Prof. Dr. Vijay Bhargava, currently a professor at the University of British Columbia in Vancouver, Canada, is an internationally renowned researcher in the field of telecommunications. His research findings make important contributions to developments in today’s satellite and mobile communications systems. Professor Bhargava was awarded the Alexander von Humboldt Foundation’s Research Award in 2015 and spent a year conducting research at FAU, where he worked closely with German colleagues in the field of digital communications. The Renate Wittern Sterzel Prize for the promotion of equal opportunities and diversity at FAU was awarded to the Department of Psychiatry and Psychotherapy led by Prof. Dr. Johannes Kornhuber, and Prof. Dr. Ingrid Artus, Stefan Kerber-Clasen and Judith Holland from the Institute of Sociology in recognition of their outstanding commitment to promoting diversity in academic and organisational culture. Prof. Dr. Johannes Kornhuber and his department have made and continue to make an exemplary contribution to ensuring equal opportunities for men and women, and to the implementation of the target agreements on promoting women in academia. Prof. Dr. Artus and her colleagues have made an excellent contribution to promoting gender research in the field of labour market and union research.